On 11 April 2019, the Defense Minister of Sudan, Ahmed Awad Ibn Auf, announced that the President Omar al-Bashir had been removed from office and was under house arrest along with a few members of his inner circle. General Ibn Auf proposed that a transitional body of military and technicians lead the country for a two-year period after which elections for president would be held. Some have called the events "a recycled coup". Hassan al-Turabi was close in his ideological positions to the Egyptian Islamic Brotherhood, having been a member in his youth. To gain his Islamic ascendency he had to break the ideological and political power of two Sufi groups - the one led by Sadiq al-Mahdi (who on a personal level was his brother-in-law) the hereditary leader of the Mahdiyya Sufi Order (or Tariqa as these are known in Sudan) and the Mirghaniyya Order led by Muhammed Osman al-Mirghani who claimed descent from the family of the Prophet Muhammad. For al-Turabi, the only way to break the power of the two Sufi Orders with political influence was to develop a non-Sufi Islam, based on traditional Islamic jurisprudence but interpreted in a modern spirit, open to all. For al-Turabi, such a movement would have an influence well beyond Sudan. Al-Turabi taught his doctrine and helped in the training of military, police, academic, and administrative cadres. This al-Turabi - al-Bashir division of power worked from 1989 to 2000 when al-Bashir thought he had enough support from his inner security circle to be his own man, and he started cutting some of the puppet strings, probably influenced by Saudi Arabia and the United Arab Emirates who were always worried by the Islamic Brotherhood coloring of al-Turabi's thought. Darfur (the home of the Fur people) was always marginal to the policies of modern Sudan. In 2000, Darfur's political leadership had met and wrote a "Black Book" which detailed the regions systematic under-representation in national government and the lack of services, in particular education and health. Despite the facts and recommendations, the "Black Book" led to no steps to increase the political and economic position of Darfur. 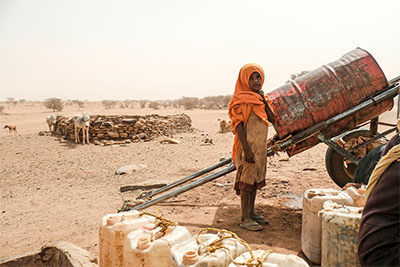 This lack of reaction convinced some in Darfur that only violent action would bring recognition and compromise as the war in the South had led to concerted attention. In February 2003, two Darfur movements, the more secular Sudan Liberation Army (SLA) and the Islamist-leaning Justice and Equality Movement (JEM) joined in the hope that a spectacular armed strike would lead the government to take notice and to start wealth-sharing negotiations. Thus in one night, they attacked and destroyed many of Sudan's military planes based at El Fasher. The Sudan military lost in one night more planes that it had in 20 years of war against the South. However, the central government's security elite - battle hardened from the fight against the South but knowing that the regular army was over-extended and tired of fighting - decided to use against Darfur the techniques of arming and giving free reign to militias and other irregular forces. The government started pulling together a fluid and shadowy group called the Janjaweed ("the evildoers on horseback"). To the extent that the make up of the Janjaweed is known, it seems to be a collection of bandits, of Chadians who had used Darfur as a safe haven for the long-lasting insurgencies in Chad, remains of Libya's Islamic Forces which had once been under the control of the Libyan government but left wandering without pay when the Libyan policy changed, and probably some Sudanese daytime police and military - the Janjaweed acting nearly always at night.